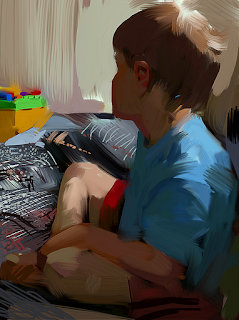 Have been addicted to doing quick studies on the Iphone...Love the retina display and just how handy it is to accurately color match something on the spot, even if just to make a note of it for later. Not to worry there has been lots of concept work in the background but for now I can share this quick one. Great piece. What app are you using? ArtStudio for Iphone works pretty well and is typically what I use. You can save and send yourself all of your layers as psds too. are you finger painting? or using a touch pen? I tried a pen in the past but found that it gripped the screen too much...have stuck to finger painting. The retina display is on the new iphones now, it has a high enough pixel density that your eye can't make out individual pixels.